Private collection, Switzerland; (P. & D. Colnaghi, London); NGA purchase in 1979. The Graphic Art of Federico Barocci: Selected Drawings and Prints, Cleveland Museum of Art and Yale University Art Gallery, New Haven, 1978, not in catalogue. J.B. [Jacob Bean]. 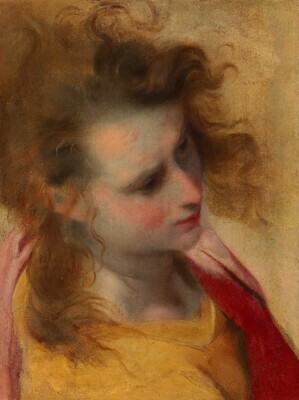 Review of The Graphic Art of Federico Barocci exhibition. Master Drawings 16, no. 4, Winter 1978: 452. Pillsbury, Edmund. "The Oil Studies of Federico Barocci,"Apollo 108, no. 199, September 1978: 171-172, 173 (note 1), pl. I.
Smith, Graham. "Federico Barocci at Cleveland and New Haven." The Burlington Magazine 116 (May 1978): 333. De Grazia, Diane. "Refinement and Progression of Barocci's Entombment: The Chicago Modello," The Art Institute of Chicago Museum Studies 12, no. 1 (Fall 1985): 36, fig. 8. McCullagh, Suzanne Folds, and Laura M. Giles. Italian Drawings before 1600 in The Art Institute of Chicago. Chicago, 1997: 18, under no. 16.